Finally, I have a copy in my own hand. Like never before, this digital research performed by the super-program created by Boss will allow scholars to find deep and meaningful connections in Edwards’ massive corpus of thought. The book, then, complements the programming in a marvelous way by providing over twenty essays on doctrinal and philosophical issues in Edwards’ personal “Miscellanies” thought-project. As to the book, contributors include Obbie Tyler Todd, Jonathan S. Marko, S. Mark Hamilton, Toby Easley, David Luke, and others. My own chapter on “Edwards and Happiness,” for example, seeks to pull together the various threads of conception throughout Miscellanies 501-832 on joy, heaven, light, blessedness and more. Edwards scholars and friends of this blog have two major projects to get excited about, and the good news is that both are in the final stages of editing and/or production. The first, The Miscellanies Companion is possible to get by Christmas (no promises! ), but we are hoping against hope that it might land in some stockings, or under some Christmas trees this year. The second, Jonathan Edwards Within the Enlightenment, will be released sometime next year in 2019. 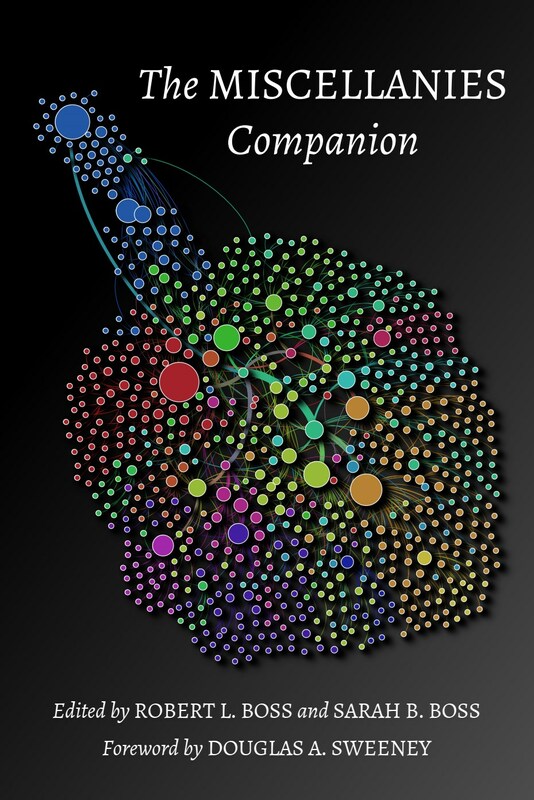 The Companion is edited by Dr. Rob Boss, the director of publication of the JESociety which has been putting together some very cool and uber-relevant works in recent days. (Check out a few of JESociety’s earlier publications here). Interestingly, this project not only features some excellent scholarship, as a world class team of writers dig into Edwards’s “Miscellanies,” but it also features some stunning interaction with cutting-edge computer digitization created by Dr. Boss. This will allow Edwards scholars to cross reference ideas and concepts in Edwards’s “Miscellanies” as never before. The written book will correspond to the digitization Boss has created in meaningful ways, and the big idea is that this will blossom into new discoveries in Edwards’s mind, as the Northampton Pastor organized his entire system of thought around tensions and connections that scholars are just now being able to put together. Here’s a brief video intro, followed by the cover art. This second exciting work was formerly given the tentative title, Jonathan Edwards and the Dark Side of the Enlightenment. If you have been expecting this one, make sure to note the title change. This is part of the exciting new series, “New Directions in Jonathan Edwards Studies.” Here’s a teaser that I recently received from John T. Lowe, one of the editors of this coming project. Jonathan Edwards within the Enlightenment: Controversy, Experience, and Thought. New Direction in Jonathan Edwards Studies. Edited by John T. Lowe and Daniel N. Gullotta Göttingen, Germany: Vandenhoeck & Ruprecht, forthcoming. As part of the New Directions in Jonathan Edwards Studies, this volume aims to examine areas where scholarship has either been previously assumed or unexplored entirely. Most of the time we only hear about one side of Edwards. Often forgotten are the other aspects of his life and context shaped—or not shaped—by the Enlightenment. For example, this collection of essays will consider his pro-slavery views, abolitionist legacy, confrontation with witchcraft, pain, populism, feminine death-bed narratives, how his world was full of violence, and several other topics. The unique collaboration of authors representing both North America and Europe are graduate students and seasoned scholars across multiple academic disciplines. Our hope is that this volume will encourage research among students of Edwards to seek new perspectives of his life and context in history, theology, literature, culture, and the like. We are very excited to move forward in the final steps of this project with Yale and V & R.
As of press time, contributors were making their third round of edits and final tweaks. This should be sent to the publisher any time now with a goal of hitting the ink press early in the new year. We will eagerly keep you posted on this project. 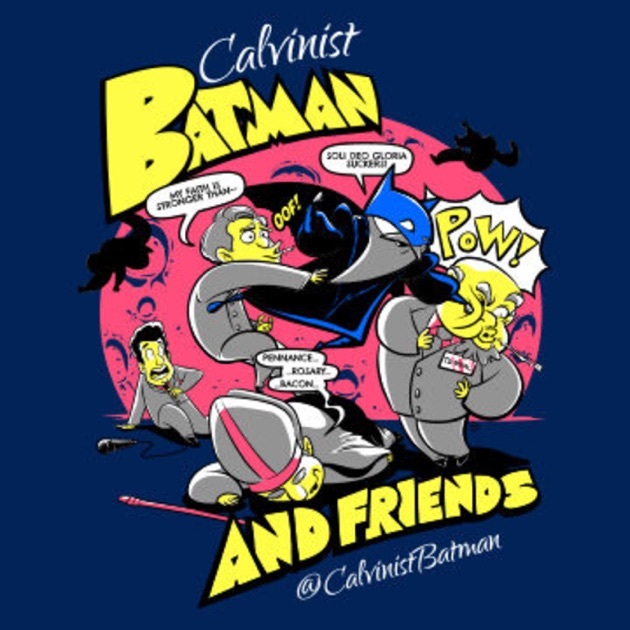 Recently, I had the opportunity to record a live episode of the Calvinist Batman podcast with its mysterious and powerful host, “Bruce.” We gathered in the fellowship hall of my home church, Faith Evangelical Presbyterian Church in Brooksville, Florida, set a couple of high tech mics with the help of our sound team, and recorded an episode before a live studio audience of about forty people, mostly church members. Comic books and puritan theologians seem like a bit of a strange combination, but on this podcast forum, it works very well. Each episode begins with some lighthearted banter about comic books, superhero movies, and other cultural curiosities. In the episode that I was privileged to record, we began talking about my own father’s epic comic book collection from the Silver Age of comics, especially my father’s prize possession of Spiderman 1-10. Here is also a quick glimpse of my dad’s collection of Fantastic Four 1-10. We progressed on, then, to discuss matters of more spiritual significance as we discussed Jonathan Edwards and his theology of joy. In our conversation, I was able to share much of what I had gleaned from my doctoral studies of Edwards’s theology of happiness, which I distilled into book form in my recent title, A Theology of Joy. Towards the end of our time together with podcast master Bruce, we even discussed some dark topics like depression. You can check this out too as a bonus Q&A episode. Check out the full episode here! (Editor’s Note: This article originally appeared as “Three Disciplines of a Happy Christian Leader: Learning from the Theologian of Joy,” on Desiring God, October 28th, 2018). During a particularly stressful period of pastoral ministry, I began to more intentionally seek out joy in God as the dire remedy for my own frayed and threadbare heart. I had diagnosed myself as markedly joy-deficient when I searched for evidence of the fruit of the Spirit in my life (Galatians 5:22). At age 35, leading a midsize Presbyterian church was already wearing me out. I became stressed at home and frustrated in the office. My coworkers could see it on my face. I needed a deeper source of joy than the world could give, despite its barrage of empty-promise advertisements and panaceas. So, for nearly three years, I plunged headlong into a deep study on eternal happiness from the theologian of joy, Jonathan Edwards. I surveyed large swaths of his major works and personal writings, mining for gladdening gold. In my study, I learned at least three methods for maintaining joy in God that Edwards practiced in his own life amid the relentless trials and strains of pastoral ministry. Although most Christians are already familiar with these methods, I discovered that studying the writings of a pastor-theologian from a different historical context opened my eyes for seeing well-worn paths in new ways. The means of grace discussed below are not new or innovative concepts, but rather the ancient paths reinvigorated by considering them afresh through the lens of a joy-absorbed sage. First, Edwards rejoiced in the natural world and the beauty of creation. Edwards saw a strong connection between beauty and joy. Both beauty and joy are to be found in the “excellencies” of God’s nature, by which Edwards meant the praiseworthy attributes of his essential being. These include God’s holiness, love, power, mercy, and righteousness, just to name a few. One of the ways that Edwards savored the excellencies and beauties of God was through engaging with, and enjoying, his natural creation. For Edwards, being in and among the creatures in the natural realm stirred his affections for God’s creative power and beauty, in turn stoking the fires of joy in his heart. I have not yet finished reading the first volume of the newly translated masterpiece of Petrus Van Mastricht, Theoretical-Practical Theology, translated by Todd M. Rester, (Grand Rapids, MI: Reformation Heritage Books, 2018) but I have read deeply enough into this volume to know that it is very good. In the age of the internet where seeming everything is apparently a click away, (especially with data mine treasures like the Edwards website from Yale), we sort of expect to have access to every academic source we could ever need. It would seem justifiable to believe that someone, somewhere out there on the interwebs had already done the work of translating this excellent work of classical Reformed theology into modern English. But sadly, except for a few items such as Mastricht on regeneration, and a short essay on preaching, this was not the case. Believe it or not, but this seminal work on Reformed theology from one of the esteemed Dutch masters is just this year finally accessibly for reading by many in the English-speaking world for the first time in history. This volume is going to be followed by as many as six more volumes which will fill out the whole complete set. I have reason to believe that this series will shortly take its place in seminaries and pastoral libraries alongside such excellent Reformed multi-volume sets as Turretin and Bavinck; both of which also required previous massive labors of translation to bring to many of us on this side of the Atlantic. This volume on “prologomena” (or foundational assumptions and beginning points) is prefaced with several contemporary statements of the work’s historical importance. Editor Joel Beeke and translator Todd Rester both make meaningful comments about the impact they hope the work will have. I am especially thankful for Todd Rester, whose skill is clearly evidenced in the smooth reading of this English edition. The layout, design, and even the typeface make this work wonderful to read. But it is Rester’s skill in bringing the original Latin (and Dutch editions) into modern English that makes this work so delightful to both the eye and mind. Also, the volume comes with an introduction to Peter Van Mastricht’s life by Adriaan Neele, as well as a somewhat detailed funeral oration given by Henricus Pontanus at the author’s own time of death. Together, these essays help the uninitiated reader to gain a handhold on the biographical life of the esteemed writer who was doubtlessly better known on the continent than across the Atlantic. Even though this first volume barely gets into Peter Van Mastricht’s actual theological system–we don’t get much further than defining theology and introducing Holy Scripture in this first volume–we can see the method and style of this historic Dutch theologian beginning to unfold. We can also clearly see his heart. As I read the first parts, what became plain to me was that Van Mastricht did not see theology as merely an academic or intellectual enterprise. No, theology plainly and profoundly affects mind, heart, and life. Over and over, PVM insists that theology, when done well, produces a mature believer who “lives to God through Christ.” Much of his work is biblical, almost in the same way that William Ames filled his Marrow of Theology with citation after citation of Scripture. It is fuller though and less punctiliar, as the author easily and naturally toggles back and forth between his own assertions and Scriptural citations. Nary a page will proceed without plenteous Biblical citations and proof texts. In every section, we can expect to see four things from PVM: (1) an exegetical exposition of a Biblical passage, (2) a doctrinal definition given in somewhat classical form, (3) an elenctic question and answer conversation or debate, and (4) a practical application for the heart and life of the believer. The exegetical sections tie each main theme directly to Scripture. Clearly, PVM wants to be biblical (even bleeding bibline, as Spurgeon once said!). After that, he attempts to both define the doctrine that he is working through and show its place and relevance among the other Christian doctrines. Or to say it another way, he attempts the process of systematizing the categories of theology within their proper relation and function. Next, he attempts to answer questions that his students, or even opponents, would ask. Here, he often challenges himself deeply to work through the opposing arguments of pagans, heretics, Arminians, Lutherans, Socinians, and atheists. Finally, and this is where his heart for the Lord really shines through, PVM makes special attempts to apply the doctrine at hand to the heart and life of his readers; often speaking to students and ministers, but never straying too far from the lives of common, everyday Christian believers. Each of these is necessary to doing Christian theology, and as I read, I often thought about how this fourfold method would preach and teach well in the church chancel or seminary classroom. It seems like such a wise way to articulate doctrine in this method, and I can imagine myself preaching sermons or teaching lessons with this fourfold method in the future. As to the books you speak of: Mastricht is sometimes in one volume, a very thick, large quarto; sometimes in two quarto volumes. I believe it could not be had new under eight or ten pounds. Turretin is in three volumes in quarto, and would probably be about the same price.1 They are both excellent. Turretin is on polemical divinity; on the Five Points, and all other controversial points; and is much larger in these than Mastricht; and is better for one that desires only to be thoroughly versed in controversies. But take Mastricht for divinity in general, doctrine, practice, and controversy; or as an universal system of divinity and it is much better than Turretin or any other book in the world, excepting the Bible, in my opinion. (WJEO 16:217).